their marrow runs lush with water. their sensual grace in half. 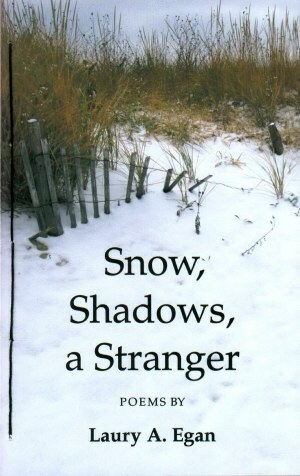 Laury A. Egan's first collection, Snow, Shadows, a Stranger, was issued by FootHills Publishing in 2009. Her work has been nominated for a Pushcart Prize, Best of the Web, Best of the Net, and has appeared in Atlanta Review, The Ledge, Emily Dickinson Awards Anthology, Foliate Oak, The Centrifugal Eye, and Boston Literary Quarterly. She also writes fiction and is a fine arts photographer. 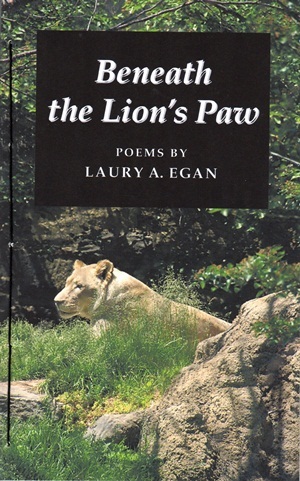 Beneath the Lion's Paw is a 72 Page hand-stitched paper book with spine - $16.00. TO ORDER Beneath the Lion's Paw ON-LINE To order through mail click here. Overviews about a collection are difficult to write, especially since I often focus on tree rather than forest, finding inspiration in a single natural detail and examining it for insights into my emotions, experiences, and memories. My first poem-written at age eight-originated in this fashion, and ever since, the weaving of self and nature into a symbiotic construct has supported me through loneliness and loss, through the blizzards and shadowy periods of life. It has also provided joy and an appreciation for the world's caprices. Despite this connection to nature, I have always felt like a stranger among people bound by family, faith, and community. My social separateness was frequently painful, but it also forced me to assume the role of observer, to work through isolation by writing, which became my trusted lifeboat, just as nature was a steadfast friend. Many of the poems in Snow, Shadows, a Stranger explore the dark corridors of the past or anticipate those leading to a final exit; others hover on the narrow ledge of the present. Sometimes my work is enigmatic because of innate reticence or, more often, because I hope the reader will substitute his or her experience for mine, and, in doing so, will realize we are all strangers. With these lines from the opening poem, Laury Egan draws the reader into a stranger's world where she considers childhood hopes and shadowy lovers, the loss and loneliness of middle age, and the awareness of the approaching last stage of life, whispering ominously in the wings. Written with lyric intensity, Snow, Shadows, a Stranger celebrates the forest, field, and sea as the poet weaves her experience of the natural with the emotional and philosophical. since only those alone can detect soundlessness. her only true friends are trees. within the enclave of shiny leaves. tastes solitude, but finds it not so sweet.